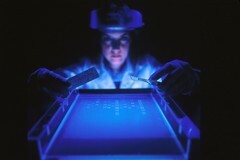 A dye marker on agarose gel used to separate DNA by a female scientist. The smaller fragments move faster, the larger ones move slower. This separation process is used to analyyze the size of DNA fragments, to map DNA, to separate fragments of DNA to create clones.